Senate Democrats objecting to returning the ‘federal windfall’ to taxpayers say doing so would produce a negative ending balance in fiscal year 2022, but Governor Kelly’s budget produces much larger negative balances without reamortizing KPERS pension payments. Spending increases listed for each year are incremental over that spent in prior years, as the KLRD reports shows approved expenditures at the beginning of the year is equal to the prior year total. 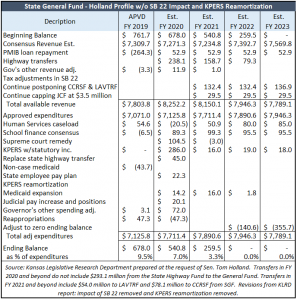 Governor Kelly’s budget is for just one year instead of the traditional two-year budget with a longer view, saying the state should move forward with ‘caution.’ The long-term view, however, shows her plan produces massive shortfalls. 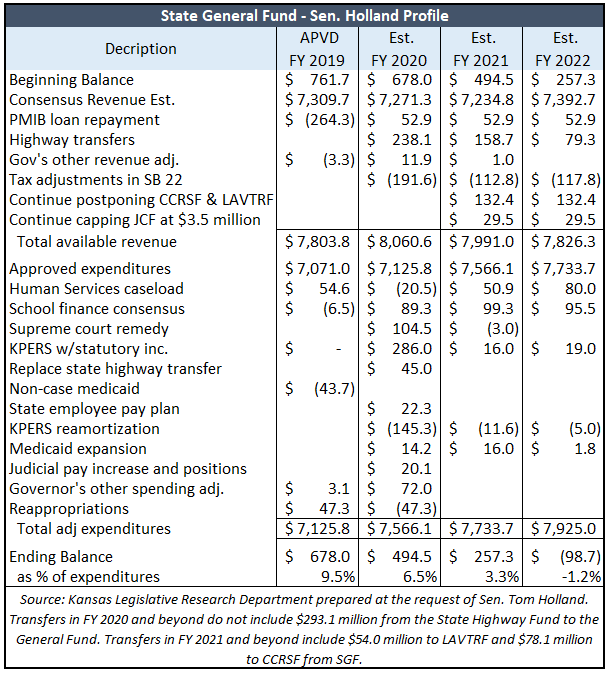 Removing her KPERS pension reamortization plan and keeping the federal tax windfall produces a $140.6 million shortfall in FY 2022 and another $355.7 million spending reduction would be needed to avoid a shortfall in FY 2023. To arrive at this, The Sentinel simply extended the KLRD profile by one year using KLRD revenue estimates from another profile and deleted the proposed pension reamortization. But those shortfalls just keep the budget at a zero ending balance. 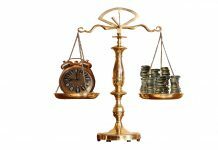 By law, Kansas is supposed to have an ending balance equal to 7.5 percent of the year’s expenditures, which would be about $600 million. Senator Holland contends that returning taxpayers money to them will produce a negative ending balance, but that’s only after other changes included in Governor Kelly’s budget. 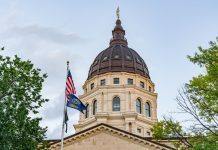 Kansas would have a positive ending balance in FY 2022 after returning the federal windfall absent the governor’s proposal to repay PMIB early, eliminating her spending increases, making KPERS pension payments as scheduled and refusing the court’s arguably unconstitutional demand for additional school funding. 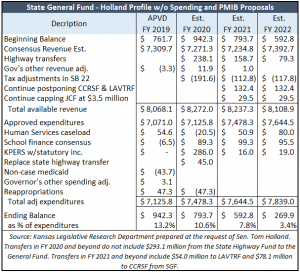 If the current estimated impact of returning the federal windfall in SB 22 is accurate, doing so could produce a negative ending balance in FY 2023 if highway transers are reduced as Kelly proposes, eliminated in FY 2023 and another $95 million school funding increase is added that year. Senate President Susan Wagle, a Wichita Republican, says returning the “federal windfall” to taxpayers is a priority this year, but Senate Democrats are pushing back. They say a plan to allow Kansas taxpayers to itemize on their state taxes whether they itemized on their federal taxes will put the state in a budget hole by 2022. 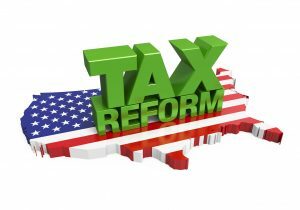 Lawmakers continue to debate whether the state or taxpayers should be the beneficiaries of last year’s federal tax reform. Lawmakers held hearings on Senate Bill 22 earlier this week. Eric Stafford, vice president of government affairs for the Kansas Chamber, told the committee that federal tax reform in 2017 created unintended consequences in Kansas. Federal tax reform increased the standard deduction from about $13,000 to $24,000 for married couples. As a result, fewer taxpayers will itemize. “That causes an increase in Kansas taxpayers state income tax liability because current law prohibits taxpayers from itemization if they do not itemize at the federal level,” he told the committee in written testimony. Michael Austin, director of the Center for Entrepreneurial Government at Kansas Policy Institute, said what lawmakers decide will be telling. 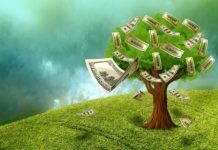 Does the money belong to the government? Or does it belong to the people? “Not allowing Kansans the ability to itemize their deductions says the state doesn’t really wish to provide relief to Kansans,” Austin said. Members of the Kansas Senate passed a similar proposal last year, but the measure ended in a tie vote in the House, effectively killing it. “Federal tax reform was done by the feds to provide some relief to Kansans but Kansas state law does not allow 100 percent of the savings to get to them,” Austin said.